Despite its bling reputation, Dubai offers plenty of activities that don’t all entail blowing through paychecks. So, if you’re trying to hold out that last week until payday, but don’t exactly feel like sitting at home, here’s a list of some great free things to do in Dubai. If you’ve got your own car, there’s no need to sign up for one of those expensive dune bashing packages. As long as you’ve got a little knowledge on desert driving (and a suitable car), you should be all set to go ploughing around the dunes. Just remember to bring a shovel, there’s a high chance that at some point you’ll get stuck. One of the city’s biggest icons, located next to The Dubai Mall features fountains that jet as high as 450-feet into the air. Consisting of five circles of fountains, the daily shows include performances from a repertoire of around 45 different songs including Lionel Richie, Michael Jackson, Andrea Bocelli, and classic songs from the Arab world. The world’s largest indoor aquarium is situated near the main entrance of the world’s biggest shopping mall – The Dubai Mall. While a large portion of the Dubai Aquarium is free to tourists, there is a paid section if you wish to explore further. Don’t feel the need to splash out though, the aquarium’s giant 33m x 8m acrylic window should be more than enough to satisfy your fishy requirements. Whether it’s to the gold souk to eye up the jewellery, the spice souk for the sights and smells, perfume souk for the fragrances or shopping at the Madinat for something a bit more fancy, there are plenty to meander through in Dubai, each unique in its own way. The hot pink flamingos really steal the spotlight at Ras Al Khor Wildlife Sanctuary, located just at the entrance to Dubai Creek. However it’s not all flamingos, the sanctuary also houses over 270 other species of birds. Check out the Flamingo Roost area to see the lanky lot contrasted against the city skyline. Dubai is stocked with public beaches-a-plenty, whether it’s 4×4 beach off Beach Road, Kite Beach in Jumeirah or the beach down by The Walk at JBR. While free to the public, you do have the option of paying for a sun lounger, but usually a towel will suffice. So bring your own and it’s gratis! The beaches can get quite busy in the afternoon, so if you’re looking to nab a decent spot you may want to turn up early. OK, so technically not free but only costing Dhs1 we couldn’t leave this out. Take one of the traditional water taxis from one end of the creek to the other. The boats hold around 20 people, taking you between Deira and Bur Dubai and is undoubtedly the best, cheapest and most authentic way to see the creek. If you fancy a bit more of a personal cruise, just walk up to one of the abra drivers and ask – no booking is required. If you’re a fitness fanatic, one of the best ways to get out and about and meet new people is through one of Dubai’s many running clubs. Groups like Dubai Creek Striders meet every Friday morning opposite the Novotel World Trade Centre at 6am (even in the summer), building up to the Dubai Creek Striders Half Marathon in December. Other similar running groups include the Mirdif Milers, Dubai Road Runners, ABRaS AC, Nike Run Club and the Reebok Run Club. In the south of Dubai Creek you’ll find Al Fahidi Fort in the Al Souk Al Kabir area. Built in 1787, the fort was reopened to the public in 1971 as an official museum that displays the history of Dubai and its heritage. IT’s free to see the fort, but if you want to venture inside it’ll cost you Dhs3. Inside you’ll find antiques such as pottery and weapons, pictures of old and new Dubai, an astronomy and natural phenomena wing, history of pearl diving, marine life, folklore and more. If you fancy something a touch more on the artsy side, head down to either Al Quoz, Bastakiya or DIFC and explore some of the many free art galleries the city has to offer. Whether it’s a quirky exhibition at the M.A.D. Gallery in Al Quoz, or something a bit more abstract at Opera Gallery in DIFC, the exhibitors change regularly – so you can always be sure to encounter something new by the time you’ve done a full circle. There’s stylish boutiques for the window shoppers, vast white beaches for the, er, beach-goers, a running path and free outdoor gym for fitness fanatics – The Walk at JBR is always abuzz. There’s the small outdoor Covent Garden Market (closed during the summer! ), with stalls offering up jewellery, food and homeware, as well as performances by street entertainers, and random pop-up events. During the winter months when the weather’s a little cooler, take advantage of some of the city’s parks – many of which come kitted out with exercise stations, walking paths, play areas and more. Some of them charge a nominal entry fee (Dhs5 to Dhs10), however a few of them are free, including Satwa Park and Al Barsha Park. The oldest residential area in Dubai, Bastakiya in Bur Dubai was constructed back in the late 1600s, and the buildings have since been restored to their former glory. 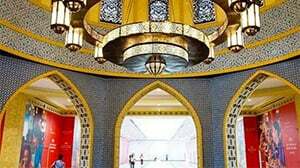 While great to just stroll around, Bastakiya also houses the Sheikh Mohammed Centre for Cultural Understanding, Dubai Museum, Arabian Tea House, and the Majlis, Ostra and XVA galleries. Just go and allow yourself to get lost, that’s the best way to view it.